I spend better than an hour behind the wheel of my car traveling back and forth to work each day, and one of my favorite pastimes seems to be what I will write on my blog when I get a chance. "When I get a chance." It seems I've been so busy being creative that I haven't had time to write about it. Until now. I had the joy and pleasure of designing and curating an exhibit of fashion dolls for a little history museum in south Florida. Old Davie School, with its four classrooms of tall windows and Dade County pine floors, turned out to be a wonderful venue for exhibiting dolls. I'm prejudiced, I know, but, I really think we did a good job. 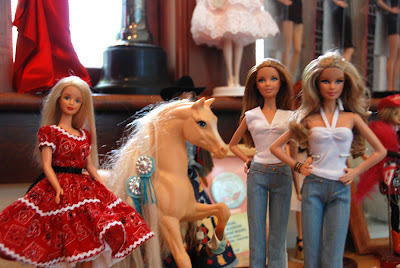 My Barbie pal, Denise, contributed many of her wonderful dolls and we covered the gamut, from vintage to modern, including pop culture (think Munsters and Elvis!) and holiday dolls! And, of course, lots of fashions and accessories! I created all the signage and collateral which can be viewed here. It's not often a person gets this kind of opportunity, so I enjoyed every aspect ... from the planning and execution to the graphic design and marketing! I was incredibly fortunate to get to work with Leslie, the executive director of the school, too! She had lots of wonderful ideas and I hope she's as happy with how things turned out as I am! We couldn't resist! 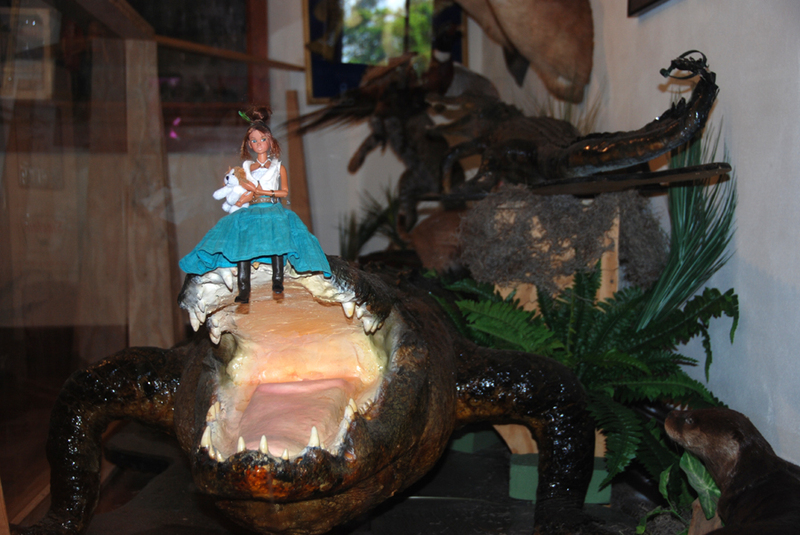 This is a huge alligator from the Everglades, on loan from Mr. Bergeron. "Beach Rodeo" Momoko is riding on his snout! The kids loved it! 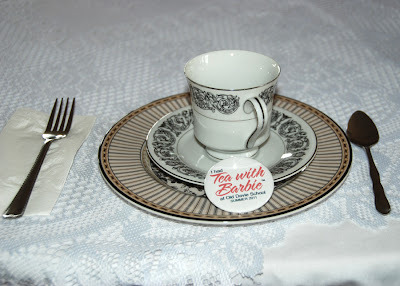 We hosted "Tea with Barbie" last Saturday afternoon and more than a hundred people showed up! It was utterly delightful (I've always wanted to use that phrase and really mean it) to see women of all ages dressed up for an afternoon tea. Some wore hats, some wore tiaras! 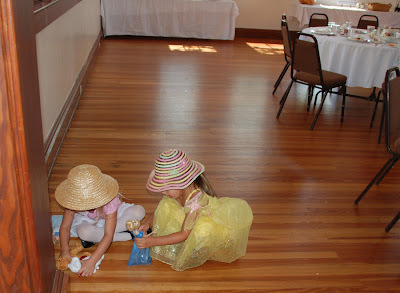 Many of the younger guests brought along their Barbie dolls and it really WAS like a dream for me. Each guest received a button as a little memento of the afternoon. It says, "I had Tea with Barbie at Old Davie School." Cute, huh? 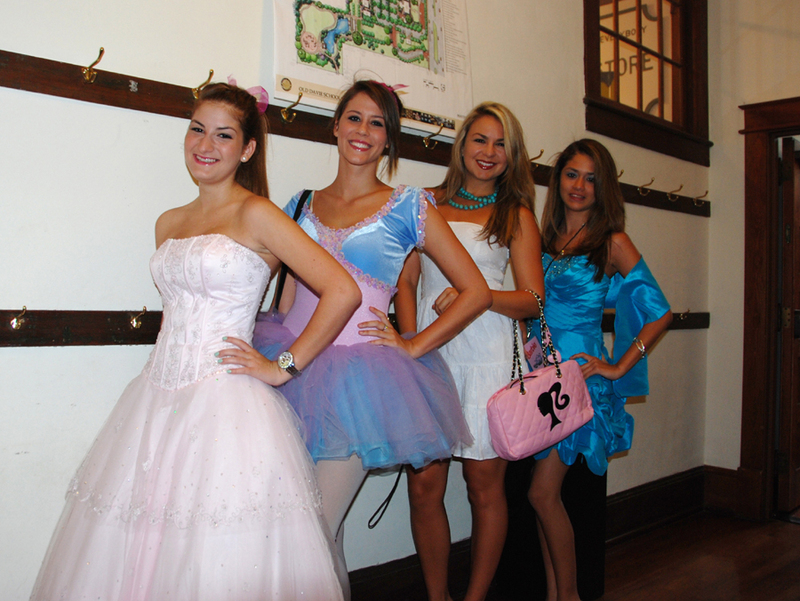 I caught two of the "live" Barbies and a Ken arriving at the school before the guests arrived! Here is "Birthday Barbie," "Ballerina Barbie" and a Barbie Basics "Ken." This was the executive director's idea, and what a wonderful idea it was! The "live" Barbies were a big hit with guests! They're so beautiful, aren't they? The littlest guests, in their tea attire, playing with ... who else? Barbie!